Given the glacially slow Arduino touch-screen TFT display as a first pass UI for the Kenmore 158 sewing machine, I need some UI elements. I need buttons. Lots of buttons. There may be other states, but those should be enough to get started. Aren’t those just the ugliest buttons you’ve ever seen? The garish colors identify different functions, the crude shading does a (rather poor) job of identifying the states, and the text & glyphs should be unambiguous in context. Obviously, there’s room for improvement. The point is that I can begin building the UI code that will slap those bitmaps on the Arduino’s touch-panel LCD while responding to touches, then come back and prettify the buttons as needed. With a bit of attention to detail, I should be able to re-skin the entire UI without building the data into the Arduino sketch, but I’ll start crude. As before, if you don’t see rabbit and snail glyphs, then your fonts don’t cover those Unicode blocks. It turns out, for some reasons that aren’t relevant here, that I’ll be using the Adafruit Arduino LCD panel for the sewing machine control panel, at least to get started. In mulling that over, the notion of putting text on the buttons suggests using getting simple pictures with Unicode characters. Of course, displaying those characters require a font with deep Unicode support, which may explain why your browser renders them as gibberish / open blocks / whatever. The speed glyphs look great on the Unicode table, but none of the fonts around here support them; I’m using the Droid font family to no avail. An all-in-one-page Unicode symbol display can lock up your browser hard while rendering a new page. That’s roughly two half-cycles of the full-wave rectified AC with about 100 ms between pulses. 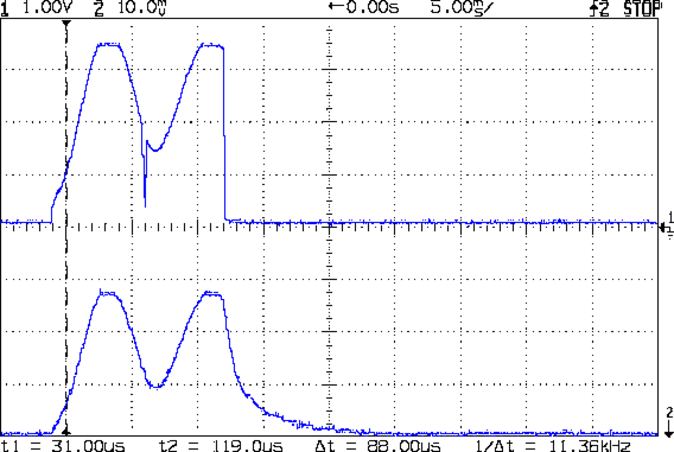 The upper trace comes from the differential amp, the lower trace from the Tek current probe at 1 A/div. 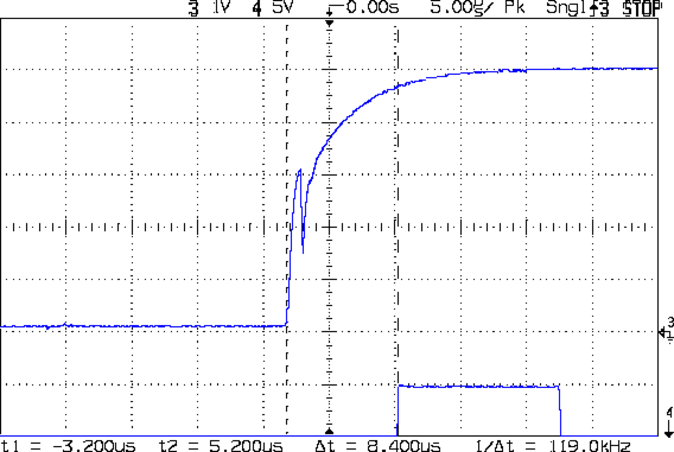 The overall amp transconductance looks to be 1.3 A/V = 1.3 A/div, minus that small DC offset, so the ADC range is actually 6.5 A. That might be a bit too much, all things considered, but not worth changing right now. That nasty little spike in the middle of the diff amp output occurs when the collector voltage drops to zero and the ET227 shuts off, but the motor current continues to flow due to the winding inductance. In the first scope shot, the Tek probe doesn’t show any spikes in the motor current, because there aren’t any. The dropouts between successive pairs of half-cycles show where the firmware shuts off the current and goes once around the main loop. The map() function flips the sense of the analog voltage coming from the pedal, so that more pedal pressure = higher voltage = lower delay. 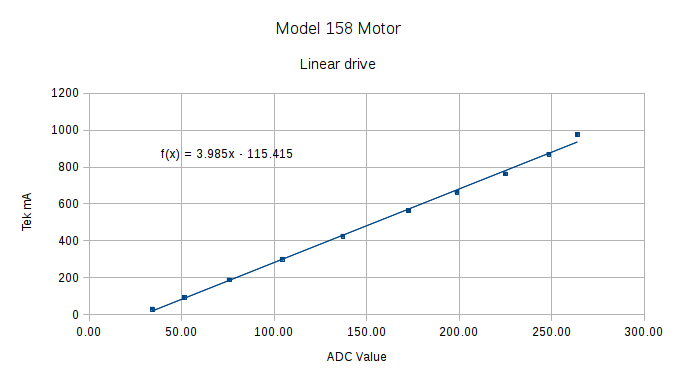 The pedal voltage produces ADC values from about 185 through 860, with a pleasant sigmoid shape that gives good speed control. The maximum motor speed isn’t quite high enough for bobbin winding, but I like what I see so far! Those are 1% resistors, chosen from the heap for being pretty close to what I needed. 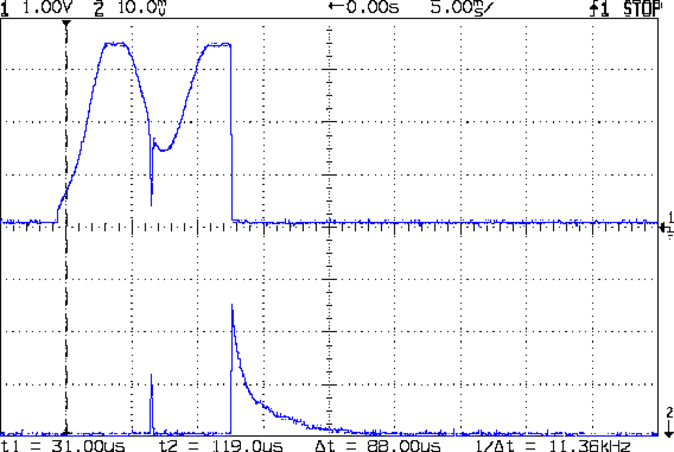 Given that it’s an LM324 op amp, we’re not talking instrumentation grade results here. 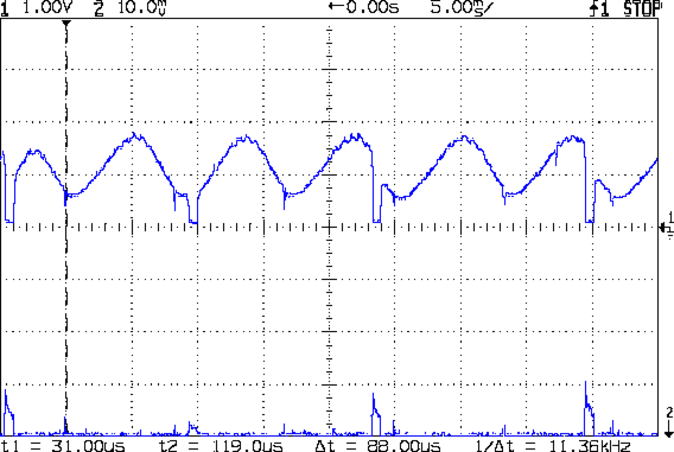 The linear fit gives the actual current, as seen by the Tek probe, for a given ADC reading. The trimpot controls the offset voltage at zero current; working backwards, ADC = 0 corresponds to 140 mV, a bit higher than the actual 90 mV. Close enough, at least for a linear fit to eyeballed data, sez I. Working forward, the maximum ADC value of 1023 corresponds to 4 A, which should suffice. The data comes from a routine that increments the setpoint current by 50 mA every five seconds, bouncing off 250 mA on the low end and 1 A on the high end, and writes the values to the serial port every half second. The actual current need not match the setpoint current, because it’s running open loop, and I haven’t done much in the way of calibration, so these represent interesting trends rather than dependable data points. The eyeballometric slope down the middle of that blue smear comes out spot on 0.90, making the belt reduction 11.1 in good agreement with the results of those pulses. The motor starts turning at 650 mA and will continue running down to maybe 500 mA, but with essentially zero low-end torque. The horizontal range of green dots at each current setting shows that, as expected, the setpoint current has only a vague relation to the resulting motor speed: setting 800 mA will produce a speed between 5500 RPM and 9000 RPM, for sure. The actual motor current resulting from a given DAC output depends on the various transistor gains, all of which depend on temperature, which depends on how long the firmware has been running the motor at which speeds. Plenty of variation to go around. 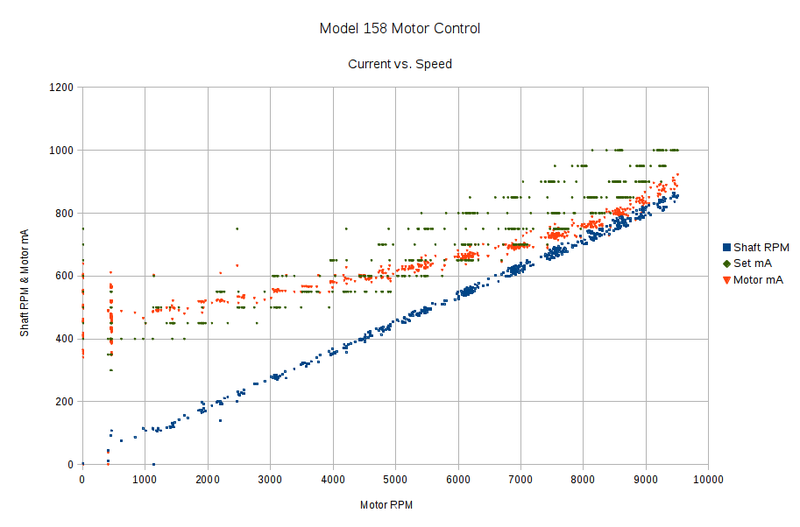 The red points show that the actual motor current, as measured by the Hall effect sensor, generally lies below the green setpoint values, so better calibration is in order. Temperature effects turn accurate open-loop calibration into a fool’s errand, but we can do better than what you see there. However, those red points do cluster much better, particularly between 6000 and 9000 RPM. You still can’t depend on the correlation, though, because the motor runs with a constant load here. In real life, the load will vary and so will the current required to maintain a given speed. 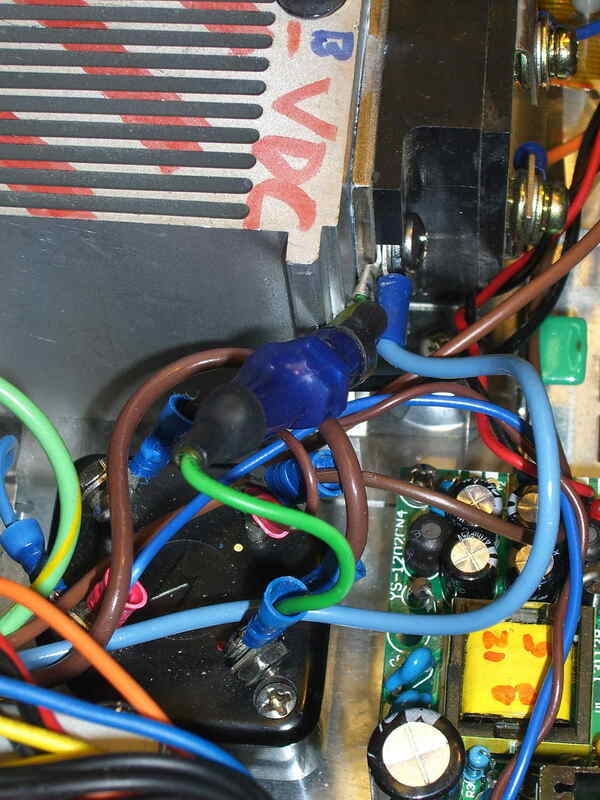 The green setpoints diverge from the red measurements at the high end, because the current limiter stops having much of an effect when the motor runs flat-out and sets its own current. After all, the original carbon-disk rheostat connected the line voltage directly across the motor, at which point the motor’s 100 W rating comes into play and limits the current to a nice sine wave with 1 A peaks. 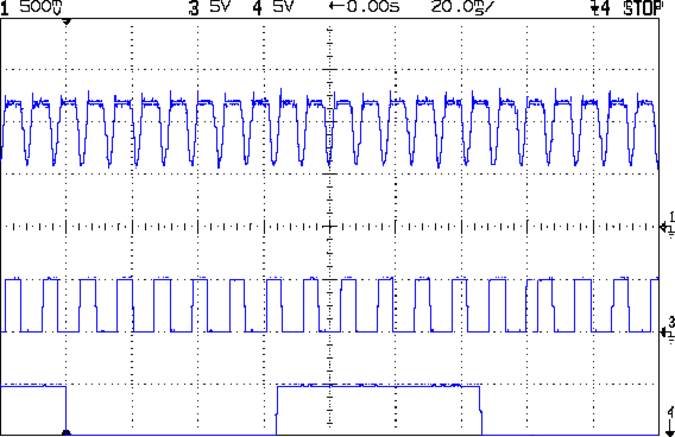 The scope trace shows that the handler takes about 7 µs to get control after the glitch (the left cursor should be on the falling edge, not the rising edge), so the input read occurs when the sensor output is over 4.5 V, causing the handler to discard this spurious interrupt. Because the interrupts don’t happen that often, the loop almost always executes only one time. On rare occasions, it’ll go back for another two values. 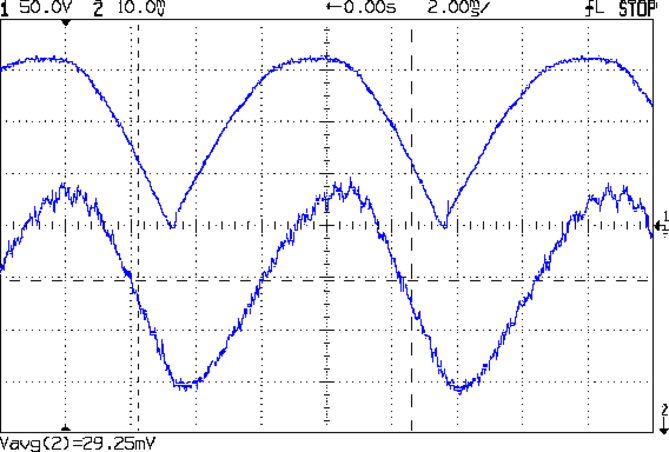 The top trace is the motor current, sampled through the ferrite toroid / Hall effect sensor / differential amp, at about 525 mA/V, so the current limit along those flat tops is 630 mA. There’s a small initial spike leading into each flat top, where (I think) the rapidly rising collector voltage rams enough current through the Miller capacitance into the base to briefly push the collector current upward. The next trace is the motor RPM sensor, ticking along at 14 revolutions in 160 ms = 87.5 rev/s = 5250 RPM. The glitch toward the right side comes from me hitting the scope’s STOP button to freeze the display in mid-trace. There’s no trace of the setscrew glitch, although that may be due to the compressed scale rather than the absence of the glitch. 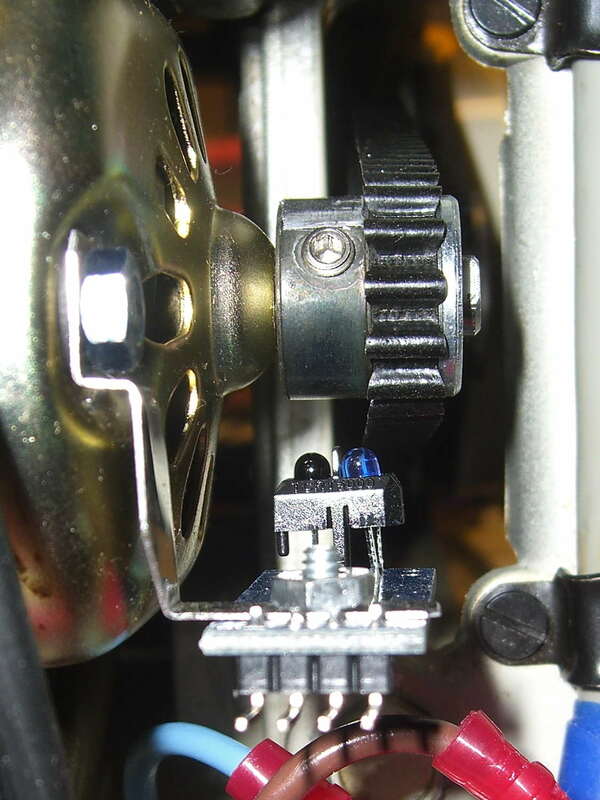 The bottom trace is the shaft position sensor, with 1 rev in 125 ms = 8 rev/s = 480 RPM. It’s nicely divided into equal halves, which is what you’d expect from looking at the counterweight. Under these conditions the speed ratio works out to 10.93, a whopping 9% over my original guesstimate. You have searched the archives for kenmore arduino.